Stacy Tilton Reviews: Fun with Balloons! Besides the traditional ways to use balloons as decorations and gifts there are lots of other fun ways to use them. 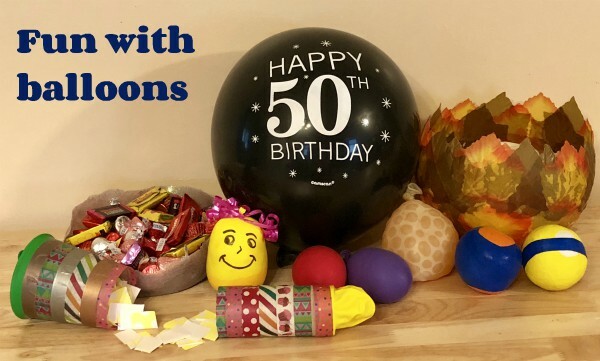 Below are a few ways my daughter and I recently used balloons to have some fun using supplies from Oriental Trading. 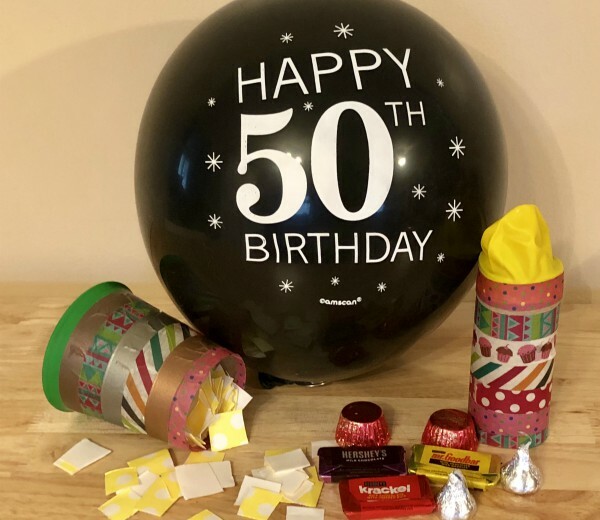 With some special birthdays happening this year we decided to explore some fun party supplies using balloons. First up what may look like your standard ordinary balloon is actually a balloon filled with candy. This is a great way to "hide" the candy until you're ready for kids to see it after a birthday dinner. Or just for a fun way to give guests a treat at the end of the party. You can also fill the balloons with small trinkets and confetti too for a little variation. Second up are two different versions of "shooters" one is using a plastic cup and the other is using a toilet paper roll. Both have a balloon at one end that you pull back on to shoot out the contents inside. We used some fun colored washi tape to decorate them for some added flair. You can use scrapbook paper to make your own colored confetti or even use marshmallows to shoot out. Next we made some bowls using balloons. This craft was actually my daughter's idea based on something she had seen on Pinterest. Basically you blow up a balloon and use it as the form for the bowl. Then you can either apply Mod Podge all over the bottom and then decorate it with things like tissue paper or in my case faux leaves, or you can mix the Mod Podge with glitter and then apply that to the balloon. 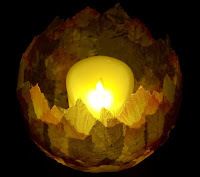 Once your creation is completely dry you'll let the air out of the balloon and be left with a beautiful homemade bowl! 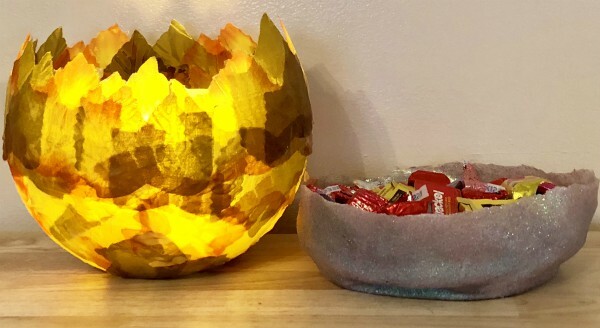 I used mine as a candle holder (with a battery operated candle of course), and my daughter used hers as a candy dish. And finally we decided to try out some different variations of making our own stress balls. There are honestly a ton of things you can put inside of a balloon to make stress balls. Here are the different fillers we explored and really enjoyed playing with. Water Beads - I used orange beads inside of a clear balloon so you could see the color through it. If you use colored balloons it's a little hard to tell what color the beads are inside. These feel really neat when you squish them around. Stuffing - For this one I filled (like really packed it full) the balloon with pillow stuffing, drew on a face, and added some ribbon for hair. As an alternative you could also use yarn and wiggly eyes. The nice part is you can squish it around and make your little "people" different shapes. Plus if it happens to get a hole there won't be a mess! Homemade slime - Ever wonder what to do with all the different versions of slime/putty you've made after it's past it's prime? (You know when it's dirty, or just too sticky to play with.) Dump some into a balloon and make yourself a squishy stress balloon. We had some slime we made with the little micro-beads inside that just never quite worked out right, it was just too sticky. I had been hanging onto it in a container not wanting to just toss out all that work. And that's when I got the great idea of using it to fill a balloon. This way we get to enjoy squishing the slime around, but not end up with it stuck all over our hands. Rice - These aren't really stress balls per-say, but more like juggling balls. You can squeeze them a little, but they are actually supposed to be juggling balls according to the craft on Pinterest. I thought they were actually pretty cool and they do feel just like juggling balls, and they work great too! You can find these and other crafty uses for balloons on my Balloon Crafts Pinterest board.